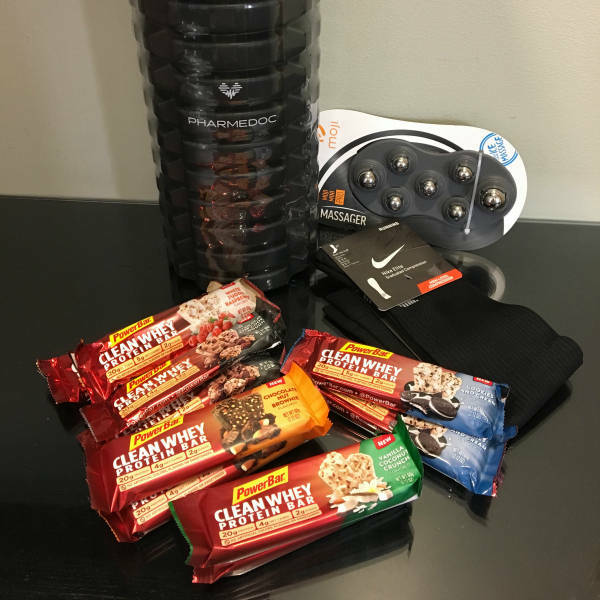 Today I’m so excited to share an awesome PowerBar giveaway with you that includes: a foam roller, foot massager, compression socks and a bunch of the newly launched PowerBar Clean Whey protein bars! Talk about the perfect pack for runners! Enter using the Rafflecopter form below. I’ll be randomly selecting a winner on March 17th! PowerBar is also hosting a super cool TCS New York City Marathon contest I have to tell you about! Last year 80K runners entered the NYC marathon lottery but only 20K were selected. This year PowerBar wants to offer those who found themselves unlucky in the lottery a second chance. The contest is also opened to the hundreds of runners who found themselves on the DNF list due to injury, fatigue or just bad luck. PowerBar believes everyone deserves a Clean Start, so to help launch the Clean Whey product line they’re offering 17 deserving athletes the chance to approach the starting line at the 2017 TCS NYC Marathon! From March 1, 2017 through April 12, 2017, you can visit PowerBarCleanStart.com and share why you deserve a Clean Start at the 2017 NYC marathon. BTW just by going to the PowerBarCleanStart.com and pledging to make a change for the better you’ll earn a coupon for a FREE Clean Whey bar! 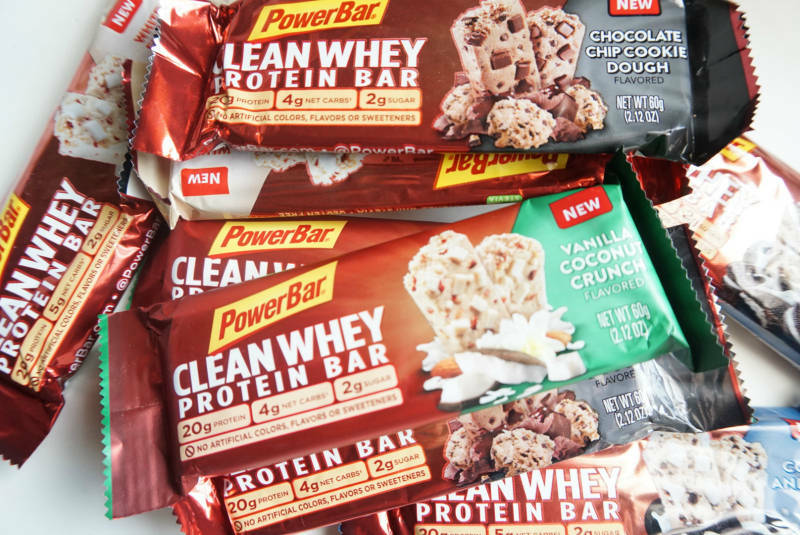 PowerBar was kind enough to send me quite a few Clean Whey bars to try and I can tell you first hand that the chocolate chips in the Chocolate Chip Cookie Dough bar are really big! You’re gonna want to try this! The stats: 20g protein, 2g sugar, 5g carbs or less, gluten free and no artificial sweeteners! Don’t forget to enter the contest up above through the Rafflecopter form and leave me a comment below telling me your favorite flavor protein bar (or anything else you’d like to tell me)! Previous Post New Vlog + Mindy Chat! What an awesome giveaway! All those flavors sound really good. Hope you have a great weekend! Thanks for the giveaway! I don’t have a favorite flavor because I haven’t eaten many protein bars! Based on the title, I thought YOU were giving away an NYCM entry and I was like, “holy smokes, how did she score THAT? !” Haha! Have a great weekend! I’ve been loving the Muscle Pharm combat crunch bars in cinnamon and raspberry recently, as well as the fit joy bars in chocolate brownie. But I love trying new ones! I like Clif bars a lot, which aren’t really protein bars, but do have a decent amount of protein. I don’t think I’ve ever loved anything that was marketed as a protein bar…to be fair, I’ve probably only tried about 3 different kinds. I might be the only runner around here that doesn’t eat protein bars…. they make my stomach hurt… and you know, I always prefer a taco over anything else! I love powerbars! Ooh I hope I win! Any cookie dough protein bar is right up my alley. I love cookie dough things! Haven’t really had many protein bars… I like nut butter flavors I suppose! Both my kids and I love PowerBar’s Cookies and Cream Protein Bars, they are great for an after workout snack. Thanks for the heads up on the NYC Marathon Entry Giveaway! I tend to like peanut butter flavored protein bars! I love the Quest bars but the flavours are limited in Canada. What an awesome giveaway! I love chocolate, but haven’t tried many protein bars yet. Have a great day! Chocolate Chip Cookie Dough is my favorite flavor protein bar.